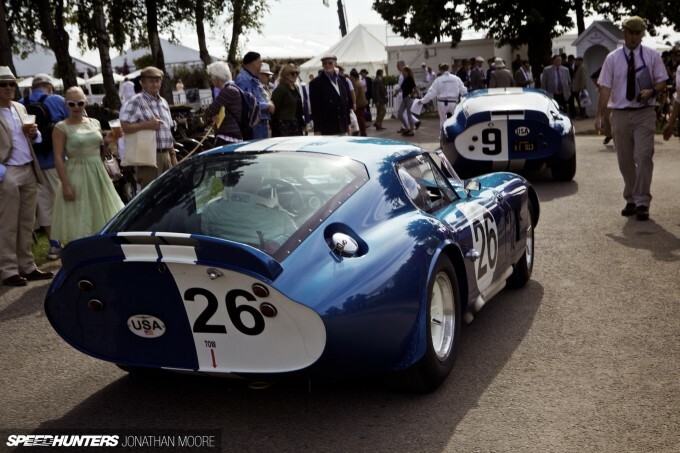 SHARE Shelby Cobra Daytona Coupés. All Of Them. 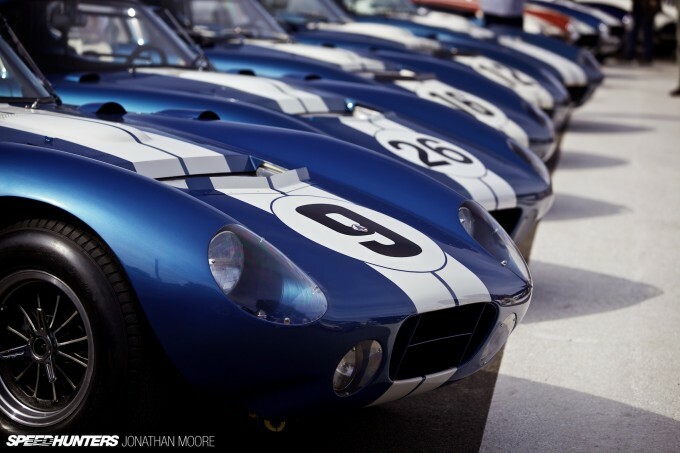 Shelby Cobra Daytona Coupés. All Of Them. 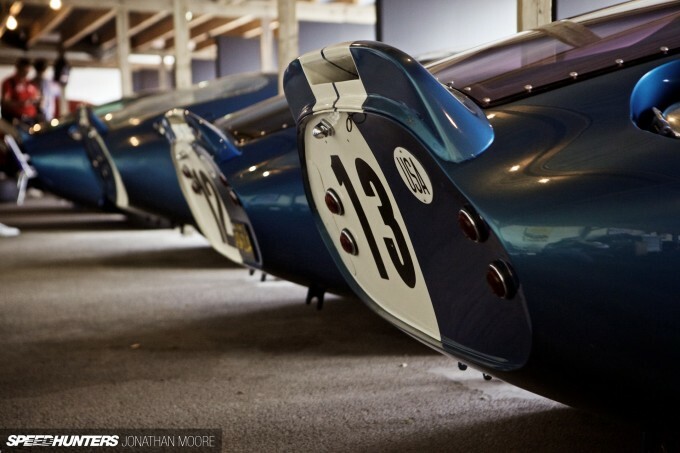 There are few things as impressive as seeing a collection of a particular iconic car in one place. It’s made even more special the more you pare down the models involved and dial up the rarity: a field of 911s is impressive; a group of Hakosukas more so; something like a squad of Miuras might be the zenith. 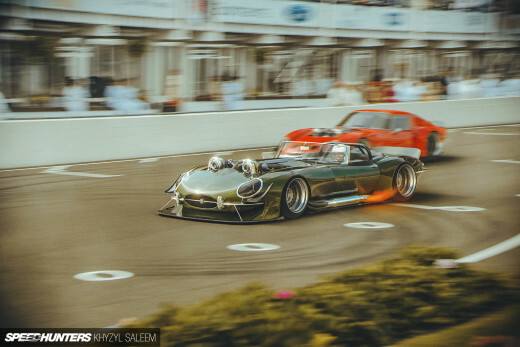 Racing cars then take this to another level, existing as they do for one sole purpose. 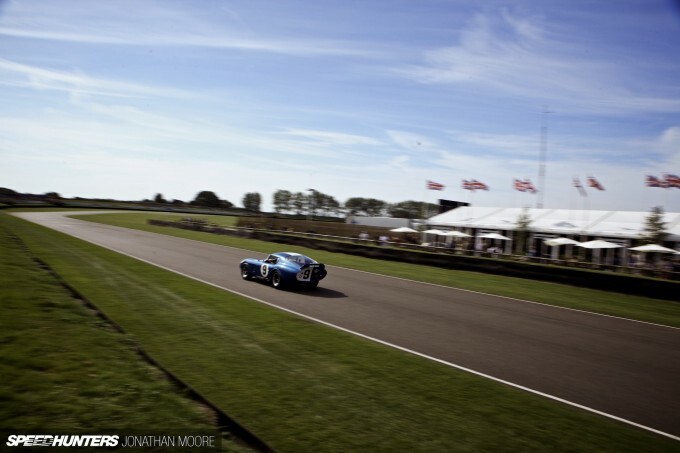 Who cares about comfort, coachwork or concours condition – the only thing that matters is how fast it went around a track. Through that focussed existence they gain personality, their battle scars worn proudly, the stickers on their flanks badges of identity. Individual cars can become heroes through their exploits, the races they survived etched into their metal bones, defining them. So it is with cars like the Porsche 956/962 and the McLaren F1. That’s definitely the case with the Shelby Cobra Daytona Coupé. Just six were built in 1964 and 1965. 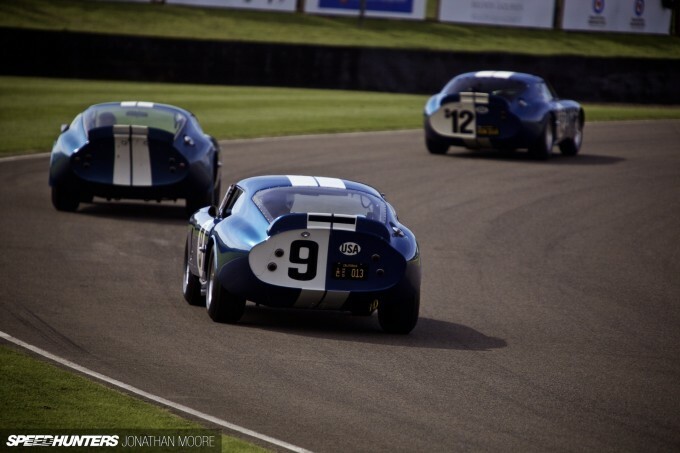 They were all at the Goodwood Revival. Six cars that bridged the gap between the evolution of a classic roadster and a ground-breaking GT: the AC Cobra and GT40. 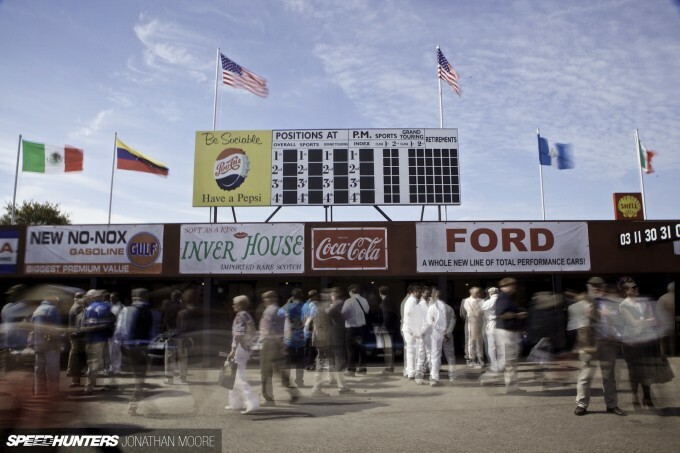 Six cars that delivered America their first World Sportscar Championship. Six cars that are bluff and brutal, yet sublimely beautiful. 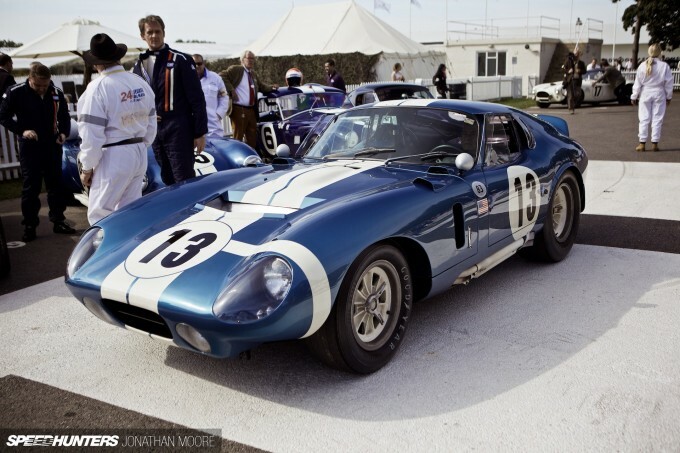 Seeing a Daytona Cobra Coupé today isn’t a massive rarity if you go to a major historic racing event, mostly due to the number of continuations and replicas that are in circulation. 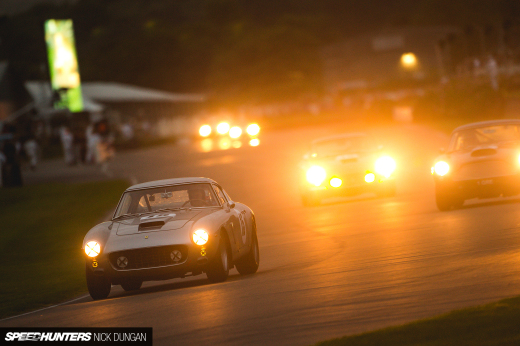 In period it was a different story: the Daytona Coupés only raced for two seasons, and at a limited number of tracks. 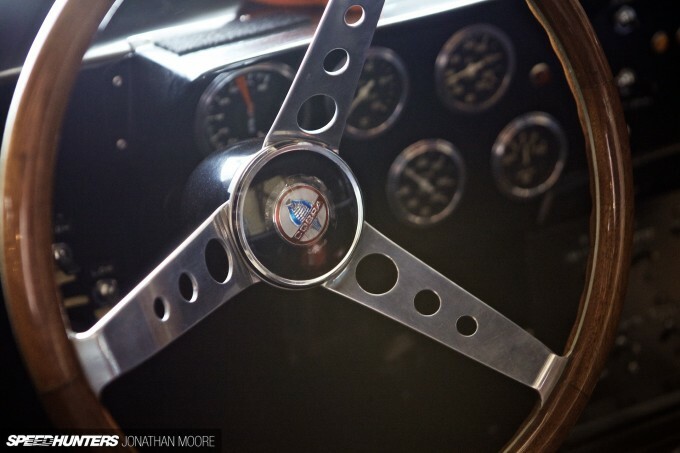 At the Revival we got to see the real thing, and you just can’t beat authenticity. CSX2287 started it all. It’s the original prototype that was ‘lost’ in the 1970s, only to be found in 2001 in a rental storage unit. Un-restored except to get into running condition, its raw look sums up the origins of the project. 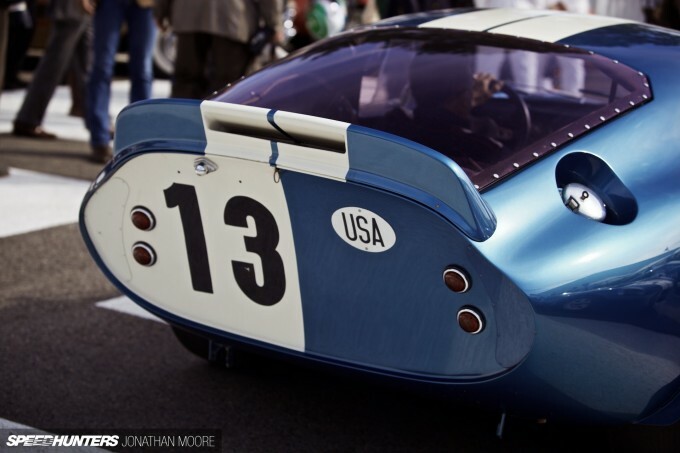 This car’s first race also gave the model its name: the initial run was at the ’64 Daytona 2,000km. The Coupé was put on pole, though a fire stopped it during the race. However, the next month it won its class at Sebring, before running alongside sister cars at the Le Mans 24 Hours two years straight. Chassis CSX2299 was the second car built, their production moved from the US to Carrozzeria Gransport in Modena. 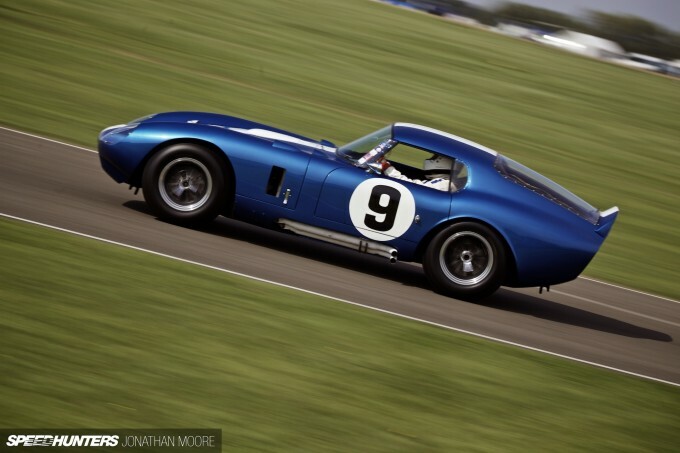 It was a 200mph racing monster, winning at Goodwood (the famous RAC TT), Sebring and Daytona in 1964 and its class at Le Mans in ’64 and ’65, whilst setting lap records across the board. Whereas the creation of the prototype was a true evolution, its body formed organically by hand-creating panels across wooden bucks, the shape of the Daytonas built in Italy is more defined and sharper. CSX2601 won at the supremely dangerous home of slipstreaming, Reims in France, in ’65, and was entered by Ford France in the ’65 Le Mans 24. 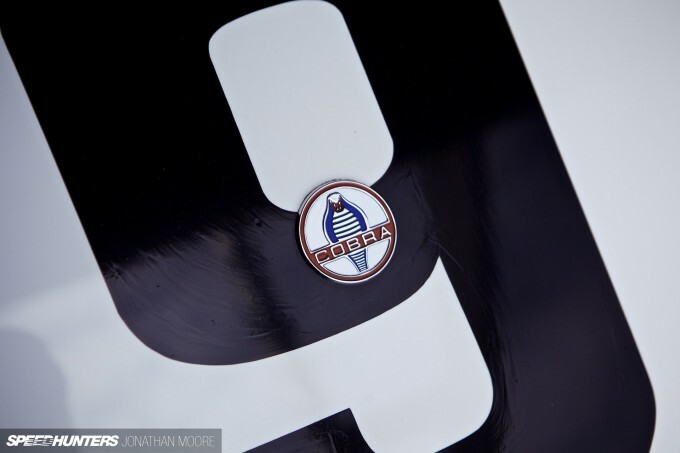 The Reims points haul bagged Shelby the world title. 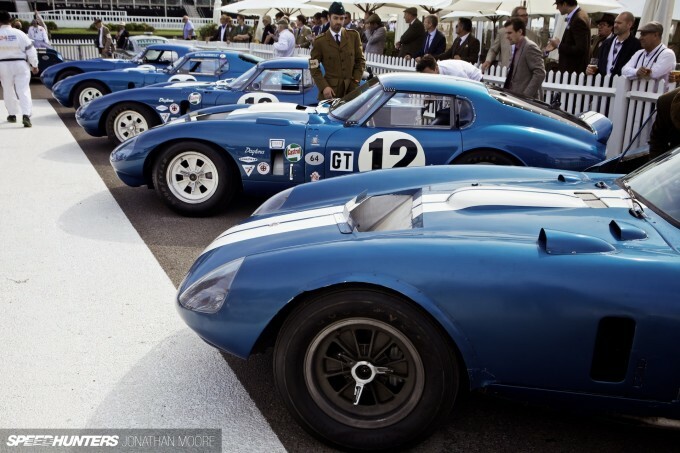 CSX2602 was one of a quintet of Daytona Coupés at Le Mans in ’65 (alongside half a dozen GT40s: Ford really did want to beat Ferrari), liveried for that race in the red of Scuderia Filipinetti. 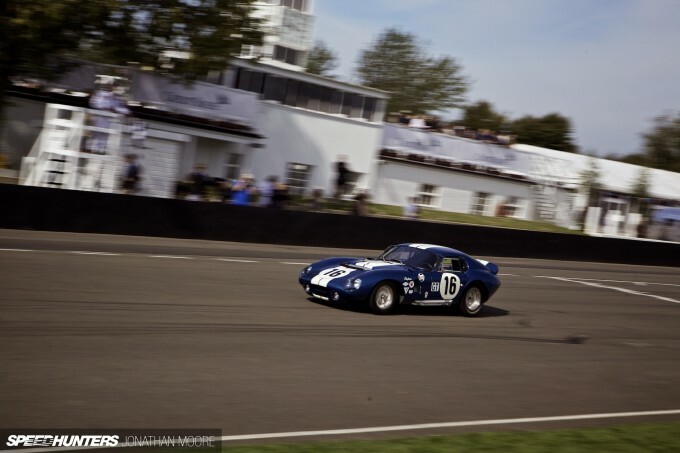 CSX2300 was the third car run by the renowned British race team Alan Mann Racing across the ’65 World Championship, who took over the international programme after Daytonas had blitzed Sebring and Daytona with clean sweeps of the podium. This car was then leased by Ford France for the 1965 Nürburgring 1,000km. CSX2286 was the final car to be produced, despite the lower chassis number, and was part of that ’65 onslaught at Le Mans. 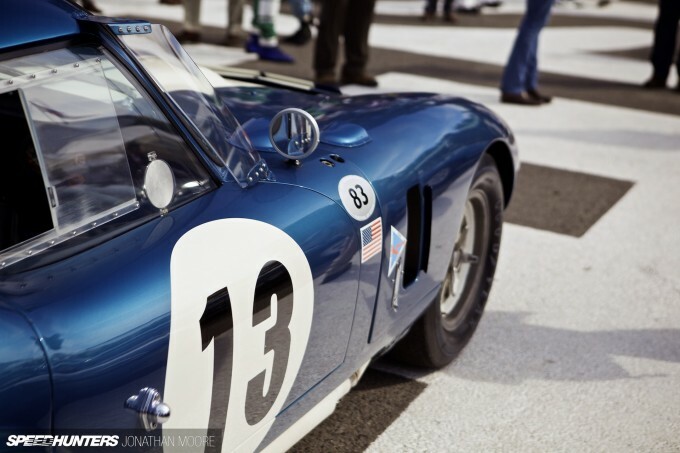 The fearsome AC/Shelby Cobra had already been successful in racing, but the long straights of Le Mans were its weakness. There it could lose more than 30mph compared to the sleek Ferraris. 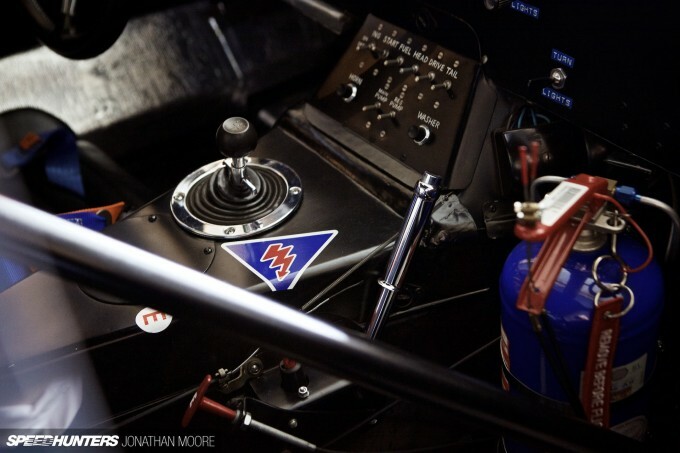 Carroll Shelby, a winner at Le Mans in ’59, put designer Peter Brock to work – almost predictably he’d had studied at Art Centre in Pasadena, like so many famous automotive designers. The elongated coupé bodywork and Kamm tail more than solved the aero limitations, though the original shape of the roadster is clear between the axles and in the rising rear flanks. More elegant it might have been on the outside, but the powerhouse engine underneath was still a beast. 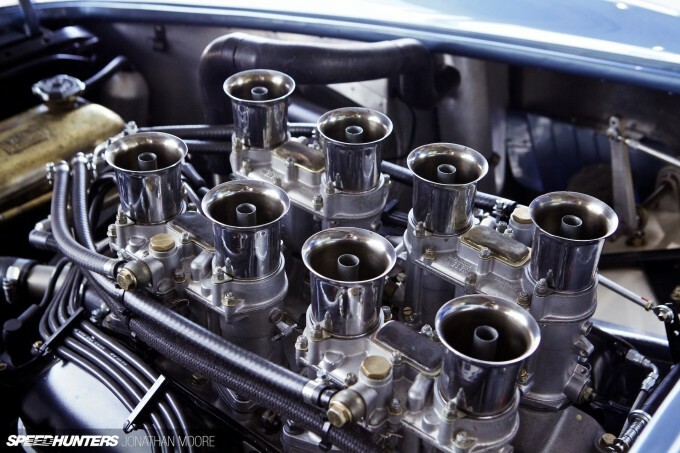 It mounted the same massive lump as its Cobra forebears: a cast iron, 4.7-litre Ford 289 V8 with quad Weber carbs full of low-down grunt, putting out around 390hp for a one ton dry weight. 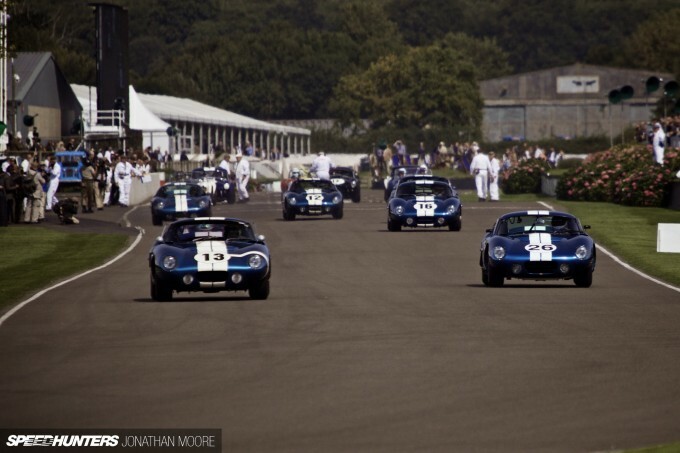 Goodwood’s inner paddock was dedicated to the half-dozen Daytonas, decked out in tribute to the Sebring of 1965. Another six significant Cobra roadsters backed them up, from an early prototype to the ultimate evolution in 600hp 7-litre behemoth from ’65. All 12 took to the track for massed demos over the weekend, with one of the Daytonas also racing at full tilt in the RAC TT race. The six original Daytonas had been brought together from all over the world, coming in from Japan, Germany, Argentina and the US. 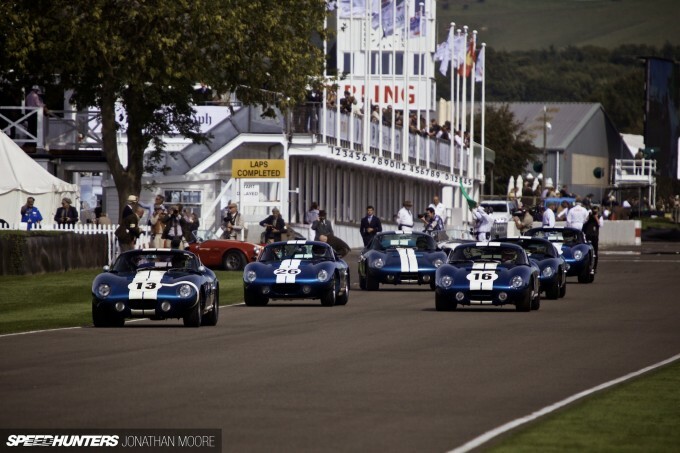 In 50 years, they’d never been in one place at the same time – until this glorious weekend at Goodwood. Who knows if they ever will again, making this gathering of snakes even more special. 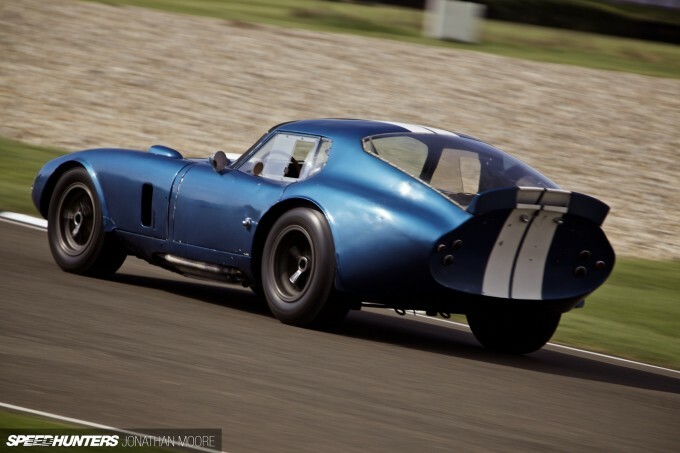 Jaguar E-type Low-Drag... Ferrari 250 GTO... Mercedes-Benz 300 SLR Ulhenhaut Coupe... Toyota 2000GT... Datsun S30... and this one, the AC/Shelby Cobra Daytona Coupe. Those six cars comprise the six most drop-dead gorgeous cars in my book. And seeing all six of the lattermost in one ribbon of tarmac is beyond stupefying. Wow that's beautiful. I just hope that driver of no.13 was not superstitious. I never have quite been able to decide whether I love or hate the violently abrupt bum of these cars - but I think I'm erring on the side of love. 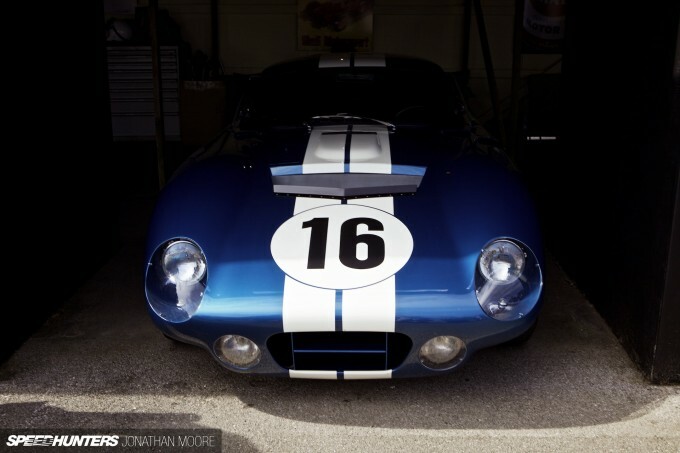 racecar, thanks in large part to Carroll Shelby's association with the Ford Motor Company. Those truly were the "good old days". I'm seriously impressed they flew in the mythical CSX2287. I saw CSX2287 at the Philadelphia Auto show in 2014. Spoke to the car's curator (possibly the owner? ), and he let me behind the rope to walk around the car. The Daytona Coupe is probably my favorite car ever, and to see the original - the one that started it all - was such an amazing experience. As far as I know, it's still kept at the Simeone Museum outside of Philadelphia. I was recently at Shelby America in Vegas. During a tour of their collection and factory the guide talked about these cars briefly. 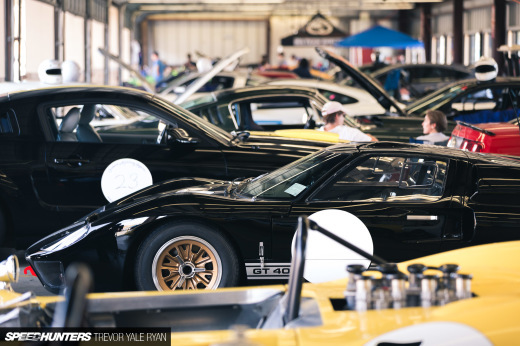 Apparently these cars were so close to not existing today... After these cars were raced Shelby saw no value in a used racecar and the cost of shipping them back to the US was too much. He was simply going to abandon them. However some officials weren't happy with that idea and told Shelby to take them or pay for the disposal of the cars in the ocean. Apparently shipping the cars back to the US was cheaper. Shelby doesn't actually own any of the 6 Daytonas. They all belong to private collectors. 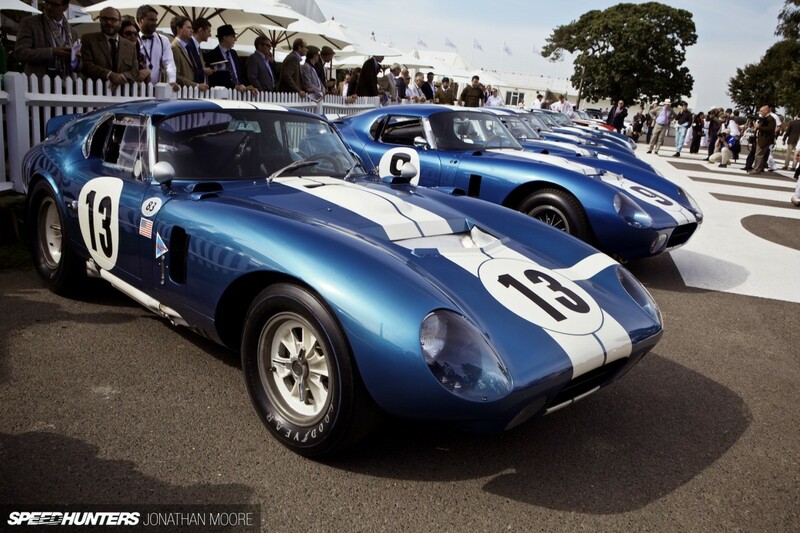 However I believe next year Shelby will produce a handful of Daytonas. Some really fantastic imagery here. Personal favorites are the number 9, it's so awesome to see the sloppy brushed (read "perfect") application of race numbers and the long exposure at the paddock. As always, excellent work. Dmsq_ Dmsq_ Yep, really something to remember... In these days of facsimiles it's quite the thing to achieve – but that's the Revival! Tinj Thanks! It's lovely to see the dried brush strokes on the numbers isn't it? There's something about hand-applied liveries. SN95 Lover Isn't it just? Interesting additional details there, so thank you! Peter_Kelly So you should! Peter Kelly, you bad man. Kamm tail = always win. @Kuroneko UWerqxTeam_MJ Oops, ha, yes... that slipped through. Though, you know Ferrari's reputation... .;) But I completely agree with that list – 100pc! Respect to the responsible person who had the idea and work to track down all the cars and make the arrangements to bring them together! I got to see (and touch ;P) number 16 at the Shelby Museum in Vegas. 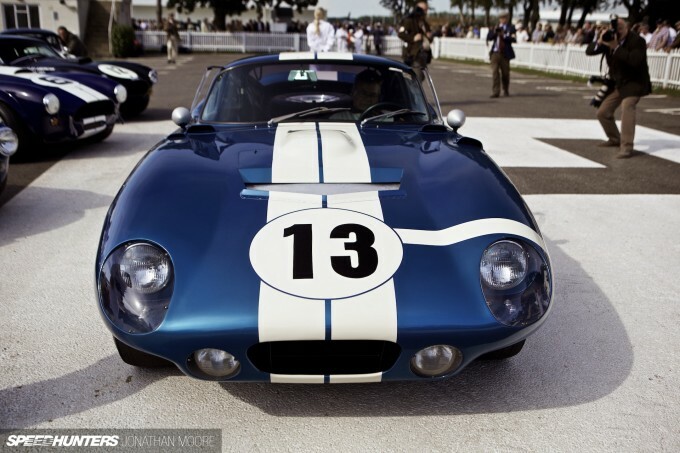 Shelby Daytona is one of the most iconic cars ever created. Bowing down with admiration and respect to the late Mr. Shelby and the great men who created and drove this car in to the history books. The Daytona Coupe is one of my favorite cars of all-time. I grew a love for them working for Kirkham Motorsports for a short time and we built three replicas while I as there. All the photos of it on their website were taken by me. We tested them at Miller Motorsports Park, the same place where CSX2299 resides. Every time I am at MMP I have to stop at the museum and see this car, the GT40s, and other Shelby cars. 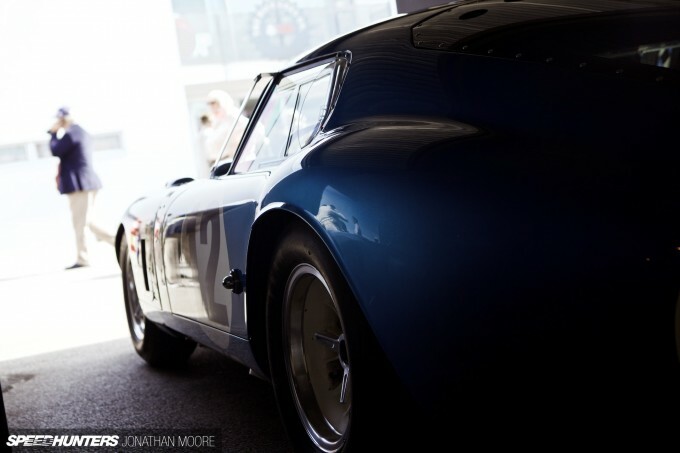 remind me mighty 250 GTO, a beauty of sleek 60's body form. I saw the prototype at the Simeone museum in PA.